Anna Rabbal Aalameen, Wa Rala Salla Alaih. Dafiye Jumla Bala, Tum Pe Karodon Durood. Man Lahu Shaqqul Qamar, Wa Nazil Sallim Alaih. An Nasaara Wal Majoos, Aslamoo Ala Yadaih. Man Taa’la Sharafa, Kulluhum Salla Alaih. Hubbuhu Li Madhaba, Rabbana Salla Alaih. Dard Ko Kardo Dawa, Tum Pe Karodon Durood. Wal Quran Shaiun Faseeh, Alladee Unzil Alaih. Theek Ho Naame Raza, Tum Pe Karodon Durood. Fathima Qurrathu Ayn, Jadduhum Sallo Alaih. 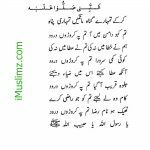 YE NAAT BOHT ACHI HAI AND I LOVE THIS NAAT !!!! This makes me want to learn urdu so I can know why this naat comforts me somehow and I’m not Muslim. mashallah, subhanallah itni nice naat – praises Muhammad Saw nicely! And Owais raza Qadri saab has such a nice voice mashallah! I wish he could come to my house on Milad like sabih rahmani did – naat are so beautiful especially when were talking about Nabi Paak! I LOVE KASHEEDAH,,,,,,,,,,,,, IT’S COOL MY HART…………..
I’m christian girl i’m proud to b christian . From chidhood i blv god like crazy . Sir i don’t knw y but i like this naat very much . I really appreciate the voice of Qadri sahab and the lyrics are so beautiful that it directly touches the heart and inspires one to follow the path of Rasulallah. A millions thumbs up to you!!!! Log nate pak sunte the pr jab se ye nate pak owais bhai ne padhi log diwane ban gae.